Whisk lemon juice, soy sauce, tahini, sugar, ginger, and garlic in a small bowl to combine. Gradually add vegetable oil followed by sesame oil, whisking constantly until emulsified; set aside. 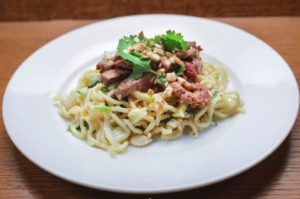 Toss noodles, steak, kohlrabi, scallions, cabbage, and cilantro in a large bowl with three-quarters of reserved dressing to combine and evenly coat; season with salt. Top with cashews and Harrisa spice and drizzle remaining dressing over.